The new P-TACTICAL SUPERDOT provides incredible image clarity, a crisp 2 MOA dot and the compact, lightweight specifications needed for fast point-and-shoot action. Nikon’s proprietary TRUCOLOR lens-and-coating technology provides a lifelike view with both-eyes-open sighting. The P-TACTICAL SUPERDOT offers 10 illumination brightness levels and retains the last setting upon the next power-up. Nikon solidly integrates the P-TACTICAL SUPERDOT’s internal components within a shockproof, waterproof, aircraft-grade aluminum housing for a lifetime of reliable performance. Powered by a single CR2032 battery. Multiple layers of anti-reflective coating on all air-to-glass surfaces maximize light transmission, brightness and contrast, with 10 levels of brightness for virtually any light condition. 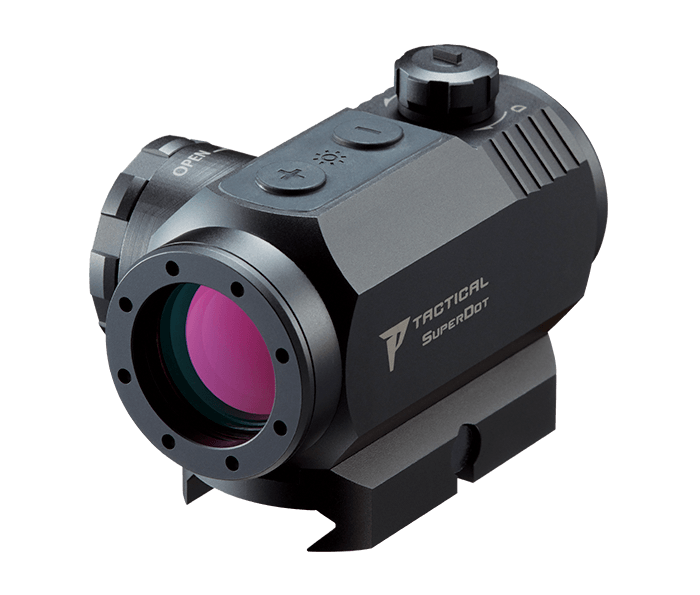 The P-TACTICAL SUPERDOT is also night vision compatible, with the first two brightness settings that are compatible with night vision gear. Comes with the TRUCOLOR proprietary coating that minimizes the bluish tint common to reflex and dot sights. Includes spacers to provide 1/3 co-witness or full co-witness. Raised protrusion functions as flat driver for adjustments. IPX7 specification and shockproof construction shrugs off hard recoil and rugged use.